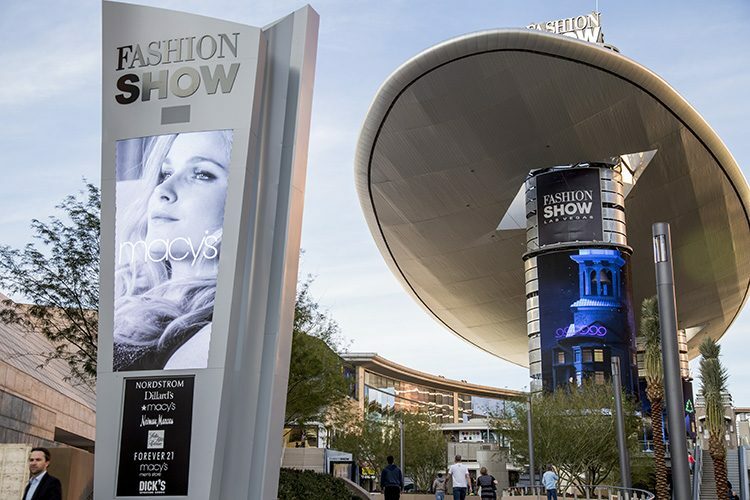 Las Vegas Fashion Show shopping centre, located in the heart of the strip, has received a face-lift with nearly 10,000 sq metres of LED screens on its façade, front columns holding up the Cloud canopy and marquee pylon display. Owned by General Growth Properties Inc (GGP), the shopping centre attracts over 10 million visitors worldwide and features 250 boutique shops, restaurants and year-round events. 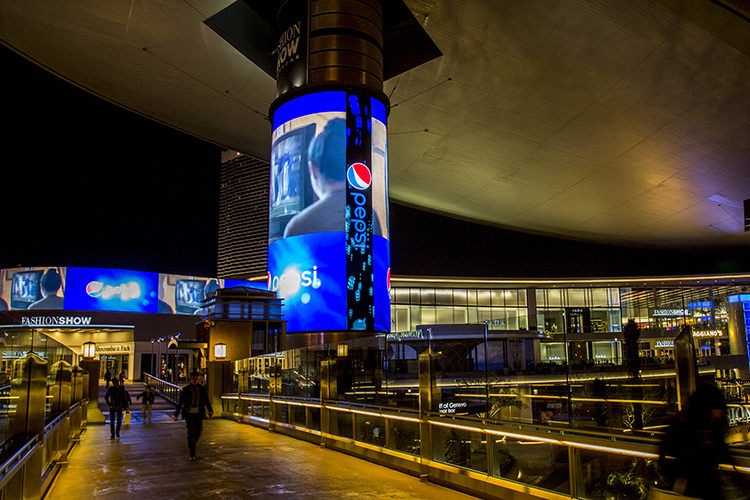 Brian Henry, in collaboration with Show+Tell, designed the concept for the dynamic LED video displays, created and developed by LED leading manufacturer Daktronics. 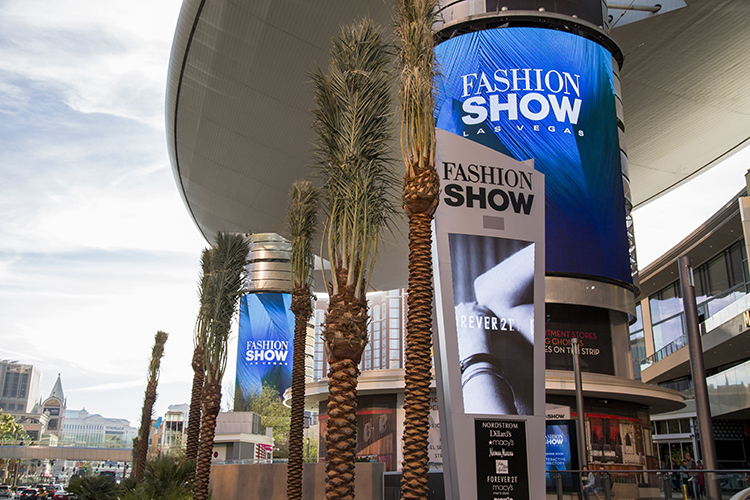 The digital signage screens feature Daktronics’ proprietary LED video display technology, with a specially-blended formula designed for the Las Vegas environment. The LED screens have to compete with increased brightness and sun-cutting contrast to mitigate wash-out. In total, the signage encompasses more than 12 million LEDs, more than four million pixels, approximately 7,000 LED modules, a colour capacity of 281 trillion colours and 69 loudspeakers on 68 amplifier channels capable of 48,000W at maximum output. The displays cover the entire plaza and are organised into 20 zones to provide customisable coverage for everything, from localised background music to small concert level performances. 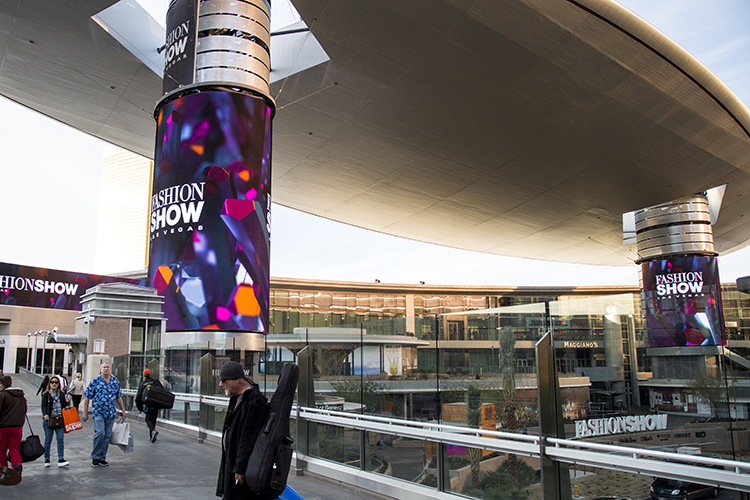 “The Fashion Show Mall screens are today one of the largest and brightest of the Las Vegas strip. But size and brightness doesn’t begin to explain the significance of our proprietary technology. 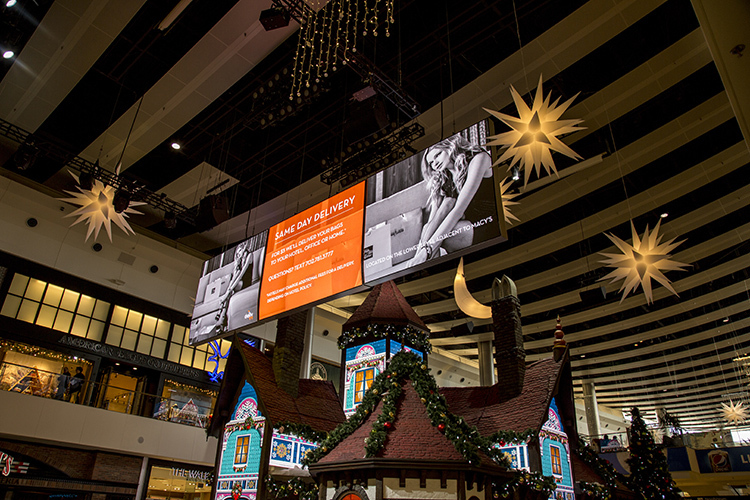 Daktronics engineering guarantees a brighter and resilient display that will still be impactful in years to come,” said Ed Wasserman, Daktronics Special Projects Director. Content is always king, and considerable focus was directed to ensure the delivery of premium video and imagery. The video material was provided by a variety of content creation teams. New York City-based Show+Tell, in partnership with Brian Henry Design, created a full menu of programming for the platform.